The president of South Korea, Lee Myung-bak, is paying us a visit. I have never seen such a long queue at our university. Nor have I seen metal detectors and security boys here before. But a president is a Very Important Person, and his visit is a Very Special Occassion, so everything is different from normal. The head of state of a faraway country is more popular than any visiting scholar would ever be, and draws a much larger audience, it seems. The auditorium is packed with students, staff, and Korean expats eager to hear their president speak. I have never attended a president's speech, but I know enough about foreign relations as to not expect any surprising scholarly insights. Nevertheless, I do feel somewhat uncomfortable by the superfluous hospitality the president receives. I do not mind those large, shiny velvet flags on the background - the nation state remains the basic paradigm of international politics, after all, and its symbols continue to take centre stage - but I do not quite understand why every second sentence of the president is rewarded by a new round of applause. Not everything he says is equally brilliant. The speech is revealing, though. First of all, one would have expected the proud president of a G20 country - and former CEO of one of the planet's biggest multinationals - to be able to deliver a speech in English. Alas, Mr. Lee depends on the support of interpreters in order to get his message across. A pity, since the high-pitched, nasal voices of the interpreters distract from the pleasantly low voice of the president himself. And who knows, some of his speech may have got lost in translation. Why else, one may wonder, did one Korean journalist eagerly report that Lee made "a thinly veiled swipe at Japan for failing to address long-running grievances over its militaristic past (...) [, which was] the latest appeal by Lee to Japan to sincerely repent for wartime atrocities committed during its 1910-45 colonial rule, such as sexual enslavement of Korean women for its troops"? This journalist seems to have projected his own anti-Japanese ideas onto a speech that did not address Japan-Korea relations at all. In fact, Lee's claims that South Korea is "a peace-loving country" were mainly directed at North Korea, not at Japan. Neither, incidentally, did he address China, or Southeast Asia - with the exception of North Korea, intra-Asian affairs were completely absent from his talk. Unsurprisingly, Lee's personal success story is closely intertwined with the success story of Hyundai, which is closely intertwined with the success story of the South Korean nation state. In Korea, large enterprises are very much part of the ideological state apparatus; the success of companies like Hyundai, Samsung and LG becomes the success of the nation, and economic growth is presented as patriotic virtue. Hence, a central part of Lee's narrative is devoted to describing the terrible poverty of the Korean population until a couple of decades ago, and show what an exceptional collective achievement it has been to become one of the world's richest nations. 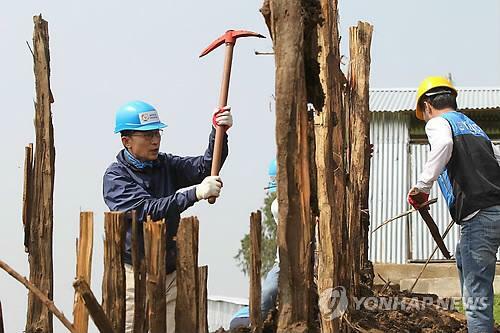 Until recently, Korea was an aid recipient; now, it proudly presents itself as an aid donor. Thus, the president argues, they "understand the minds of those who receive aid better than anyone else." Ah, I see. Is that why Korean (construction) companies are notorious for exploiting and abusing their employees in Southeast Asia? Lee states that Korea and Norway have much in common - for both are committed to doing research on, and establishing, lasting international peace (incidentally, I have never heard of a state that did not define itself as peace-loving). They are both committed to international development cooperation, as well as, apparently, tackling climate change. The president makes clear that he is very, very much committed to solving the problems of climate change. Having listened to quite a few Dutch political debates recently (national elections coming up soon) from which the topic of climate change was conspicuously absent, I feel almost moved to hear a head of state address the topic seriously. Apparently, until recently, Korea suffered from significant environmental destruction. The destruction was mainly caused by its rapid economic growth, going hand in hand with the exploitation of natural resources and landscapes, but the president blames 'climate change' - an easy scapegoat, after all. In any case, whether the erosion, floods and droughts were caused by industrial development or by climate change (or a mix of both), in recent years, Korea has done quite a bit to improve its ecology. Lee proudly shows us a picture of the 1800 kilometres of bicycle roads built alongside the re-designed national rivers. Alas, he does not mention the fact that the improvement of the Korean national environment has been achieved by moving polluting (chemical) industries to 'developing' countries. Korea understands the minds of those who receive aid, yes indeed... That is, they know perfectly well that the environmental regulations in Vietnam and Cambodia are nearly non-existent, especially if you know who to bribe. Finally, it turns out that Norway and Korea have one more thing in common. They are eagerly looking forward to having a melted, ice-free North Pole, not only because the large amounts of oil that will become available (good for Norway) but also because it will be much easier and cheaper to ship cell phones and cars from Asia to Europe (good for Korea). Very understandable, of course. But it is somewhat ironic to hear a president who just claimed he is strongly committed to addressing the problems of climate change now rejoice in the prospect of sending his Hyundai ships across the Arctic. But I should not be too skeptical. Let me end by quoting the optimistic conclusion of Mr. President: "If like-minded countries walk hand-in-hand, we can achieve great things." He got a standing ovation.